Since coming under the wing of the US Klipsch Group, Jamo appears to have gone from strength to strength. The company's range now dovetails neatly with its American masters, delivering products to regions where Klipsch (and sister stablemate, Mirage) don't go. This has, of course, necessitated a shake up in the product lines and new kit abounds. This Concert C80 system is a perfect example of said shake-up. It's the company's high point of home cinema speaker systems today (there's just a £7,500 Reference R909 stereo speaker above this), and is designed as a 5.0 system. 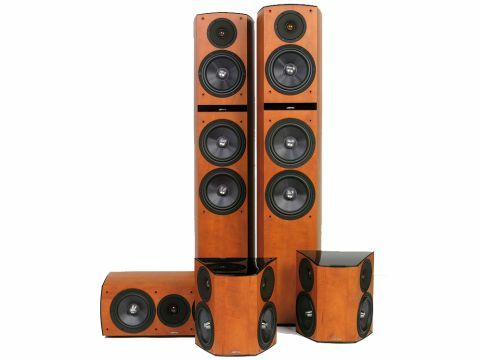 Comprising a pair of tall and heavy C809 floorstanders (£800 a piece), a C80 CEN centre speaker (£400) and C80 SUR surrounds (£300 each) - all delicious- looking in their Dark Apple wood veneer (black ash is the other option) - the tall three-way main speakers deliver enough bottom-end grunt to obviate the use of a sub in many rooms. Those that really need Jamo badges across the board can get a matching C80 SUB subwoofer, but in most cases I suspect this will be unnecessary. One of the surprises to this system is the C809. Jamo uses the two-and-a-half way speaker design as almost a company motif, but this is a three-way, four-speaker design. The bass features a pair of the company's 180mm HCC (hard conical cone) drivers, while the midrange features what looks like exactly the same drive unit, and all the speakers share the same 25mm soft dome tweeter, which sits in a horn- loaded waveguide. Both this waveguide and the back mounting cup of the tweeter are decoupled from the driver itself and effectively isolate it from the rest of the speaker cabinet. The speaker sits on outriggers with decent spikes fore and aft. The magnetically-shielded C80 CEN and the C80 SUR share a pair of 155mm HCC bass drivers. These mid-bass and bass units have a shiny solid phase plug in place of a dust cap, which allows the driver to better handle power. The C80 SUR is a handed (you get a distinct, slightly different left and right) dipole speaker... or at least most of it acts as a dipole. Traditional dipole designs generate out-of-phase sounds to the front and rear, thereby creating a diffuse soundfield which can be bass light - this system acts as a dipole above 250Hz, but a more conventional bipole design below this figure, thereby boosting bass. Jamo calls this XBR, for eXtended Bass Response. THX-chummy it ain't, but it delivers the bottom-end goods better than trad dipole designs. The bass of the speakers is a common theme to all five speakers. Which means the lack of a sub in the package really isn't a stumbling block. Chances are, if you are buying equipment of Jamo's calibre, you will be investigating specialist subwoofery anyway. And, in most British rooms, it's unlikely that you will ever need more LFE than the C809 delivers. That said, the best subwoofers bring some control to the bottom-end of things, and that could be welcome here in some settings. Use the physical size of the C809 as arbiter - if they look like huge monoliths in your living room and you are using them like a pair of giant headphones, the bass will overpower and a subwoofer would add taming control. On the other hand, if you have a room that dwarves the speakers (you live in the Albert Hall, say), then some reinforcement from a really mighty sub would help. But the Goldilocks point - putting these speakers in large, open plan listening rooms - balances the sound elegantly and makes the subwoofer redundant. These Concerts have a characteristically large sound. Perhaps too large in some contexts; it's like Texas - everything seems larger than life and twice as colourful. But, it's not so big that everything sounds vast - just that voices are more powerful and interior scenes seem less claustrophobic than through some systems. It makes for impressive visceral listening that is just great for movies. The diction of the centre speaker is particularly good, and highlights why this is home cinema through and through. It has a mild lift in the treble - to punch voices through a surround sound mix. This makes actors sound bigger and sexier than they really are (Angelina Jolie exempted, naturally). None of the intelligibility of vocals is lost in the process. And, as this sound integrates perfectly with the main and surround speakers, this makes for a powerful and exciting cinematic experience. For all this Sturm und Drang, the Jamos can be surprisingly subtle too. If you want to hear the deft touch of the best Foley artists, the C80 surrounds are good at projecting footfalls and other ambient noise round the room. Those big and boomy speakers can also be mild and graceful when called upon. In fact, the Jamo system is at its best somewhere in- between all out-action flick and a genteel period rom-com. I suspect this package is never going to be the first choice of the music buff. The speakers' overall balance is good, but pitched with clear, forward treble and deep, powerful bass to the fore. The midband is good, but not as transparent, or as ultimately neutral, as the little, square, low-volume monkey coffins audiophiles love. But, for cinema, things are very different. It's difficult not to be impressed with the C80 system; if you have the right sized room, and want a big, impressive sound that will drive from a good integrated system, these beautifully-made speakers may well fit the bill.